One of the breakout hits from DC Comics - The New 52! In these tales from issues #1-6 of the new series, Buddy Baker has gone from 'super' man to family man - but is he strong enough to hold his family together when Maxine, his young daughter, starts to manifest her own dangerous powers? As these new abilities continue to terrify Buddy and his wife Ellen, things take a turn for the worse as Buddy and Maxine begin a journey into the heart of The Red. 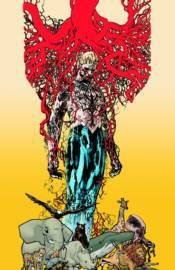 Don't miss the amazing series from writer Jeff Lemire (SWEET TOOTH) and artist Travel Foreman (The Immortal Iron Fist)!